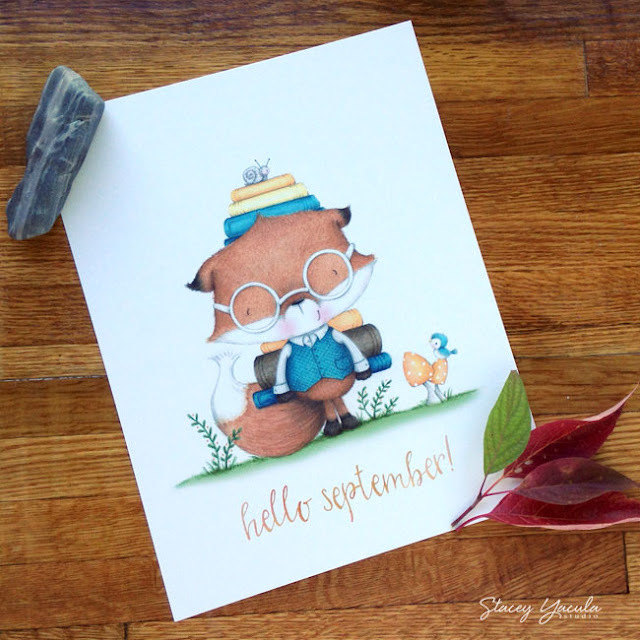 stacey yacula studio: hello september! i wanted to say hello to all of you who visit me here. as two of my babies are now in university and college and have moved out. however, i am grateful i still have one baby at home for now. i hope you enjoy this little bookworm and his friends. i think it is very fitting for this time of year. enjoy my friends and thank you for visiting! It has been a busy summer, for sure. As for the "rollercoaster" I remember that time myself and for me it was pure...well, you know! BUT, it DOES get easier. Hang in there...Our love of card making helps. As a matter of fact, that'swhat got me through it. Glad to see you back! A beautiful illustration as this Autumn season of school begins! My little one is getting bigger and starting middle school. I feel for you as yours head off to college. I know I will be there one day. And yes where does the time go?! This is so sweet!! He is adorable!! !